Walmart really is the Florida of major American retailers. However concerned you may be about what's happening there, you're always a little grateful that it's happening. Walmart gave us Yodel Boy, after all. And Florida gave us this guy. And now Walmart has delivered us this woman, who, not coincidentally, is now banned from Walmart. 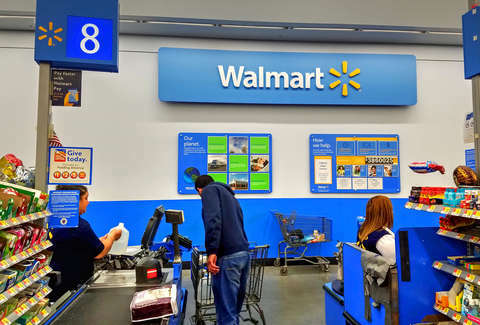 In short, police in Texas were summoned to a Witchita Falls Walmart after employees complained of a woman driving around the parking lot for several hours on an electric shopping cart -- the kind meant for customers with physical limitations -- while drinking wine out of a Pringles can. The call took place at 9am, according to a report from Times Record News, but she'd been at it since around 6:30am. You simply must admire the dedication. When police arrived, they found her at a nearby restaurant (which is understandable because all that driving must have been exhausting). Upon finding her, they explained that she was banned from the store. We realize that's a lot to take in, so let's take our time here. This woman had been sustaining this activity for several hours. You have trouble binge-watching sitcoms for that long, so give some credit where its due. She was doing this while cruising around in an electric shopping cart that belongs to the store -- something you've surely fantasized about but never had the courage to do. And finally: She was drinking wine out of a Pringles can. She was, we repeat, drinking wine out of a Pringles can. So many questions are unanswered here. What flavor were the chips, and did she attempt to pair the food and beverage with complementary tasting notes? Was this a small can that she was using as a wine glass, or was it a full-size can that she was using as a makeshift carafe? Of what vintage and varietal was the wine? We may never know the answers. But none of these is the important question. The real question is this: Should we start drinking wine out of Pringles cans? It honestly sounds really nice.